Waiting for Ghalib… – Flawed, Cracked… But Rare! 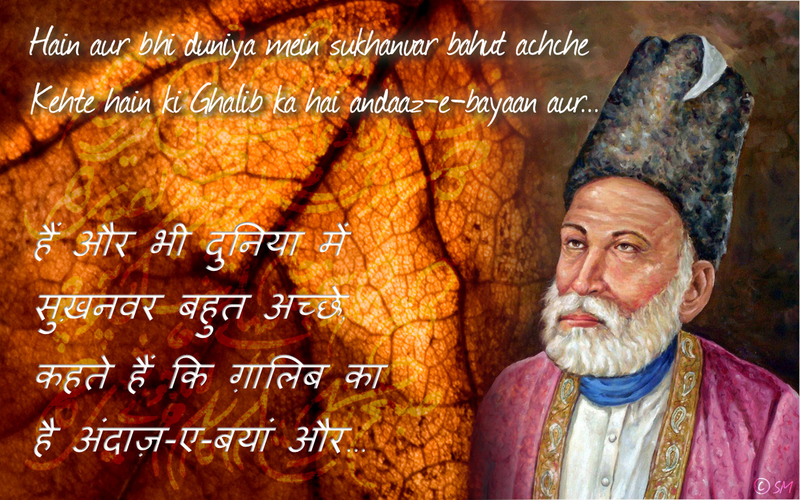 Mirza Ghalib… his poetry is in a class of its own. Often quoted, often sung as ghazals… they are entrancing and reminiscent of a timeless world. I have loved sher, ashaar, Urdu & Hindi poetry, ghazals and all for quite some time… and if not all, I used to listen to Jagjit Singh, Mehdi Hassan and Ghulam Ali. Most of those times I did not know the poet behind some of those haunting lyrics / poetry. I often assumed it was the singer himself. A lot of the meaning too was lost on me but I would still manage to get an idea of the poetry. Then, I met someone who not just understands Urdu poetry but he breathes it. He might be tone deaf (his words, not mine) but he can definitely recite the verses in a riveting way. Being a little jealous of the world in his head where he easily grasps the layered meaning of the poetic verses while I get only the direct meaning, I decided to amend that. I have ordered myself a copy of ‘Love Sonnets of Ghalib‘ – Dr. Sarfaraz K. Niazi. Now, I am eagerly waiting for the book to reach me. I have enjoyed listening to many a sher (couplet) by Ghalib recited in the Nawaab‘s inimitable style… I am hoping that the book helps me get the background and context of those lovely verses.